Estella Canziani’s Through the Apennines and the Lands of the Abruzzi (1928) is the Bible for poking around into the world of our parente. 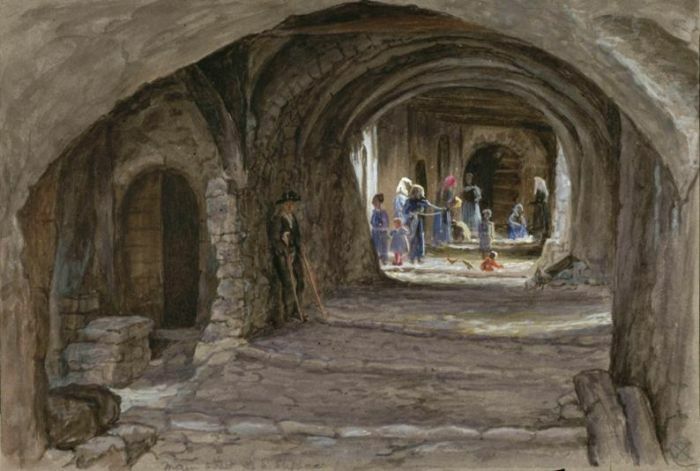 Her drawings and watercolors and study of songs, stories and customs authenticate the remote places many abandoned. Today, as we travel to these same remote villages on holiday, Canziani’s book can enrich our stay. I have begun a little project to dig up material on her artwork. 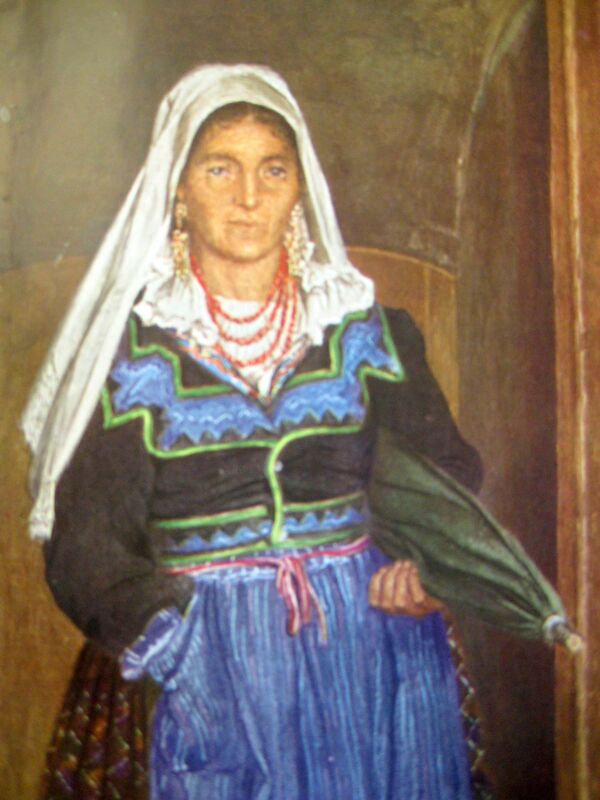 While in Mascioni, the village of my grandfather, Canziani painted a few local women in traditional dress. One portrait titled Maria stands out and I’ve challenged myself to discover more about this particular village model. When I visit Mascioni, I carry a photo of the painting, but so far I have not turned up any family members who recognize Maria and can offer me a surname. So, project “How Do You Solve a Problem Like Maria” continues with Plan B (which involves the wonders of facebook). I did make a precious little find a few weeks ago when I carried a photo of a Canziani watercolor to Santo Stefano di Sessanio. The village is well preserved and I know the streets pretty well. With photo in hand, I went to the spot that I’d guessed she painted. The arched stone walls matched those in my photo. Not surprisingly, very little has changed structurally. The frame in both the painting and my (unprofessional) recent photo show what is now the door to the conference room of Sextanio Albergo Diffuso (left). A shop lies behind the doors in the background and the stones have been changed on the street, but that’s about it. 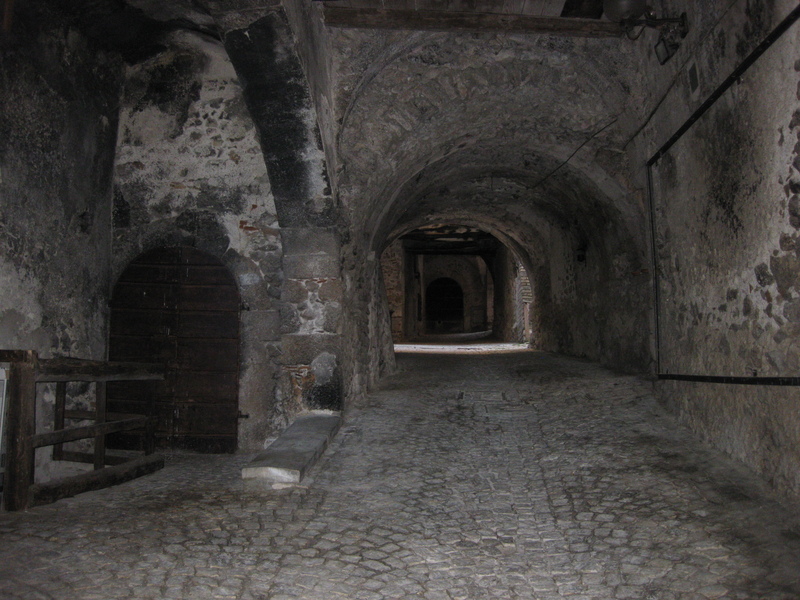 The light shines through the arched walkway as it has centuries before 1928 and 2012. Those who are familiar with the history of decline in the wool trade from those boom years (16th-18th centuries)can appreciate Canziani capturing these 20th century women processing wool for weaving- sustenance weaving would be my guess. The women in the background may be carding or combing wool to make a blanket or a bisaccha. Following is an entry from Chapter V regarding Canziani’s arrival in S.Stefano. It may offer us a clue about what these women would be making from the wool. A bend in the road….brought us to S.Stefano piled up on its hill… Behind were the stony mountains and the ruined castle…It all looked like a fairy town. There was a narrow pathway leading up to the village itself…We had written to the archiprete of the place, and he met us and took us into the courtyard where he showed us bisacche and pieces of carpet made by the peasants. Bisacche are bags made of long strips of woolen material of the most brilliant colours, and very Eastern- looking with their stripes and other designs. The two ends of the material are just turned up and sewn along their two edges to make a bag at each end. The bisaccha is thrown over the shoulder, making a bag behind and a bag in front. Architecturally, S. Stefano di Sessanio is an open air museum. But it will take a trip to either the Museo delle Genti d’Abruzzo or Museo delle Tradizioni e Arti Contadine to find this commonly worn workers’ bag. I hope one has been preserved. Helen – Is that book still available? I would love to buy a copy. I think it’s so wonderful that you were able to match up the painting and the real place and happily it’s Santo Stefano. Good luck with the blogger’s conference. What a great experience to learn more about blogging and new technologies while being immersed in a centuries-old mysterious town. By the way, Princeton right now has an exhibit of old costumes from Molise. It will be at the township building for a couple more weeks. Come and see it. Linda, it can be found (usually) through ABE books. Because it is rare, it’s costly (but worth it)and is sold buy book stores in faraway places. I was told that there is a recently published Italian paperback version, but I have no proof of this. Oh, the costume exhibit sounds wonderful. Will look into it. Grazie, Helen, for sharing these pictures. I have been searching for this book for years, and have never seen inside the pages. I, too, am intrigued by the bisaccha. I hope you find a good example of one. Photos, per favore, if you do. Helen, I look forward to reading what else you find out. Estella Canziani is one of my favourite writers, artists and folklorists, and a major inspiration to me. Over many years, I have collected all her books and they are well worth it. Zoe, I have seen your Facebook posts on EC and have wondered if we were reading each other’s mind. Her work is valuable isn’t it. I’ll be posting soon about a show of her work this September in Pescara. Mostly photos because the Abruzzo work is lost! You may already be aware of this tv cooking series, but recently I saw an old episode of Alessandro’s Italian Food Challenge in which the chef went to Santo Stefano di Sessanio in Abruzzo to be shown how to make pizzelle. That’s wonderful about Canziani’s work being shown in Pescara though terrible that much from the Abruzzo has been lost.